Our Hawaii genealogists are available to research on location. They will find and analyze the best records available to further your family history research. They can search the archives and libraries in Hawaii, as well as help you with other special requests. Our researchers are available to visit local archives and libraries to access unique record collections to help with your research. Below is a list of a few of the archives our Hawaii researchers have access to. The Hawaii State Archives function to collect all of the public archives in Hawaii. Their collections include information that dates back to Hawaii’s time as a monarchy, as well as its time as a republic, a territory, and an official state of America. Specifically, the earliest records collected by the archive are dated at 1790. The state archives also hold Hawaiian newspapers dating back to 1834, passenger arrival records until 1900, and personal papers of Hawaiian monarchs and other notable Hawaiian citizens. The Hawaii Documents Center is located in the Hawaii State Library and is responsible for collecting, organizing and distributing the publications of the Hawaii State Government, as well as the four county governments within the state of Hawaii. The center contains the largest collection of state and county documents in the Hawaii State Public Library system. The Hawaii Chinese History Center’s purpose, in their own words, is to “preserve the cultural heritage of the Chinese people in Hawaii”. Their goal is to raise awareness of the history of the Chinese people in the state of Hawaii through oral history recordings, the collection of source material, and the restoration of historical sites. Their holdings contain books, periodicals, pamphlets, photographs, genealogies, documents, and artifacts. They also hold biographies of Chinese individuals and information about Chinese immigration to Hawaii. 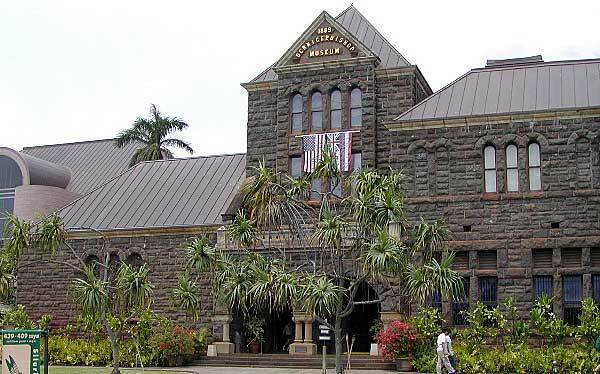 The Bishop Museum holds a rich and varied collection of primary sources and documents in their archives, all of which pertain to the history of Hawaii and the Pacific region. Specific articles in their collection include rare books, periodicals, newspapers, manuscripts, photographs, and artworks. The museum staff has also collected oral histories, sound recordings, and maps. They hold a “Visual Collection”, which was established in 1991, and contains 700 recordings, 20,000 slides, and over 70,000 aerial photographs. The Bishop Museum has done extensive research on the archaeology of the region, in addition to genealogy. They house a diverse collection of archaeological materials from both the Hawaiian Islands and 50 other islands throughout the Oceania region. The Hawaiian Mission Children’s Society Library focuses on the history of the missionary period of 19th century Hawaii. Specifically, they include information from 1778 to 1900. They hold 12,000 printed volumes and over 300 linear feet of manuscript material. Some of these records are correspondence of the New England Protestant missionaries who lived in Hawaii from 1820 to 1880, including reports, journals, and personal letters. Archives of the Hawaiian Evangelical Association can also be found here. These records contain church records of individual members, as well as reports from American missionaries and native Hawaiian pastors. The Hawaiian Historical Society’s archives are home to more than 12,000 books and pamphlets and approximately 35 linear feet of manuscript material. They specialize in the history of Hawaii and the Pacific, as well as the history of the Polynesian people. Part of their special collections include historical narratives of early voyages to Hawaii and the surrounding areas. These narratives date from the late eighteenth and nineteenth centuries. There is also records here on the social lives and customs of the native Hawaiian people. This collection is known for its newspaper collection which has files of more than sixty-four newspapers published in Hawaii in a variety of languages (English, Hawaiian, and Portuguese). The Central Union Church is the repository for all extant records of the Portuguese Evangelical Church, also known as the Pilgrim Church. It was formed in Honolulu in 1890 for Portuguese speaking Protestants. Some of their holdings include parish records, photos, documents, and burial records for the local Makiki Cemetery owned by the church. Their membership records date from 1887 to the present day. Bound volumes of church bulletins, newsletters, trustee minutes, council minutes, preschool minutes, and annual reports can be found here as well. The Lyman Museum is an excellent repository of information on Hawaiian history, with an emphasis on the history of the missionary efforts that took place. Their holdings contain 7,500 books and 10,000 photographs. Records from the Hilo Boarding School (the first school for native Hawaiian boys and founded by Reverend David B. Lyman) are located here. This collection consists of board of trustee records, financial records, scrapbooks, departmental records, and education files. The Daughters of the American Revolution society as a whole has an excellent reputation for genealogical research. The Aloha Chapter House holds business records, newspapers, and Japanese-Hawaiian publications. The Chapter House is also home to the Carter Collection of Hawaiiana. This archive contains Maritime history of Hawaii, including ships, ports/landings, commerce, and recreation. The Hamilton Library at the University of Hawaii includes many collections that might be useful in your family history research. Our Hawaii genealogists can search at this location. Some of the collections include the, University archives documenting 100 years of history of the University of Hawaii, Manuscript collections documenting the history, culture, and politics of the people of Hawaii, The Hawaii War Records depository, which documents WWII and its impact on Hawaiian residents, and the Japanese American Veterans collection. It also holds the Hawaii congressional papers beginning with Hawaii statehood in 1959-present. One can view a list of holdings at the University of Hawaii at Manoa Library. Our Hawaii genealogists specialize in researching several types of documentation and are not limited to the list above. For more information or specific inquiries about our genealogists, please feel free to contact us.